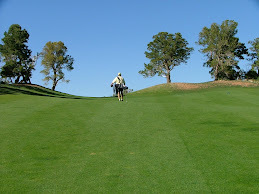 Eye On Golf is a biased examination of the golf world published solely for the author’s pleasure. Thoughts and opinions contained herein are those of the author only. Questions and comments can be directed to Eye On Golf. As a teacher of the game I read every book on instruction that comes to my desk or that magically pops off the bookshelf in a used book store. Yes, sometimes the good old stuff is the best stuff. And, if you are even the mildest aficionado of the game, you surely know that there are countless numbers of golf instruction books and articles on the market. The monthly golf tabloids bombard our minds, senses and sensibilities with changing technique and theory. As a teacher and as a player, you have to be able to dissect the good from the bad and the practical from the insane. The latest addition to my library is Golf from the Ground Up by Bob Mullen published by Burford Books. Mullen is certified as a Master Teaching Professional with the United States Golf Teachers Federation and certainly has a sound grasp of the fundamentals and the basics of the golf swing. And, since this is A New Focus on Fundamentals from a Master Teaching Pro, Mullen has structured his volume in logical and typical fashion. He begins with a discussion of the fundamentals and then progresses to the swing. At the end of the volume in his final two chapters Mullen deals with The Number One Fault in Golf, the over-the-top, loopy swinging move – and then in a chapter entitled Author's Notes Mullen lets us in on the long sought after “secret” of Ben Hogan. He takes six pages in this chapter detailing the mystery. Mullen's term for the fundamentals, the absolute necessities of the game if you want to develop a repeatable swing, is the “platform.” And, whereas most instructors give four five as the number of fundamentals, Mullen includes a sixth, footwork. His discussion on the importance of footwork is excellent worth the purchase of the book. Golf from the Ground Up is Mullen's version of Hogan's The Modern Fundamentals of Golf even to the point of illustrations by Tom Weyl. In fact we can detect a bit of Hogan in the title itself - Golf from the Ground Up – for it was Hogan who believed that the golfer needed to dig his game out of the dirt. His explanation of the fundamentals is excellent and down to earth, however, at times his discussion on the swing becomes too technical and involved if the reader is not well versed in the mechanics of the golf swing. Mullen does provide a multitude of excellent drills for the teacher to implement and the student to try. Golf from the Ground Up is definitely a worthwhile read for all golfers - highly recommended for teachers and definitely beneficial for students. Can I Get a Ruling?